No plant says Christmas quite like the poinsettia (Euphorbia pulcherrima). The world’s most popular flowering holiday plant, poinsettia has been a mainstay of the season in the U.S. for a century. Here are five things you might not have known about poinsettias. 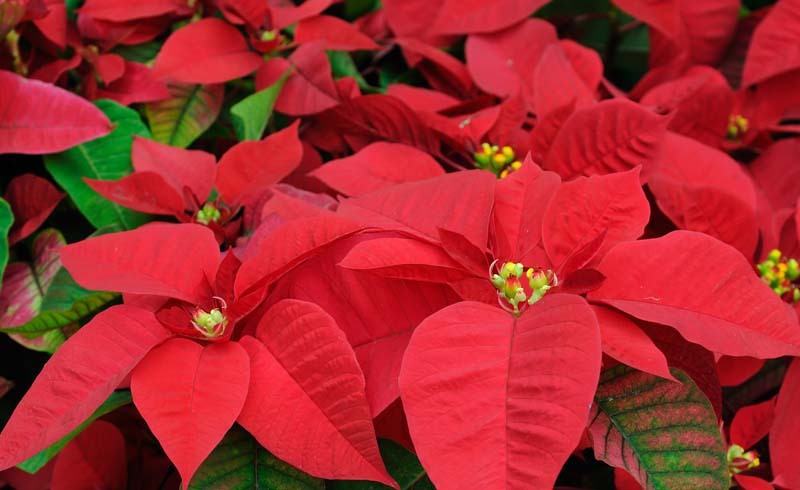 Poinsettias are actually shrubs in their native southern Mexico, growing 12 feet tall and treelike. They’re named for botanist Joel Roberts Poinsett, 19th century ambassador to Mexico, who saw the ornamental potential of the plants, even though the spindly plants didn’t have a long period of bloom. You can kill them with kindness. Poinsettias aren’t hard to keep alive, but they are sensitive to cold drafts and can be damaged on the way home from the store. Some people inadvertently kill them by watering too often (the florist foil holds the excess water, soaking the roots) or too seldom (the rootball dries out so water spills out without penetrating the soil). It’s the foliage you really like. The flowers of the poinsettia are small, yellow clustered buds in the center of the plant. What really steals the show is the bracts—modified leaves—that surround the tiny flowers. Bract colors include red, pink, burgundy, white and speckled. You don’t have to throw yours out. Most people treat their poinsettias as annuals, but it can be fun to get them to bloom again. Here’s how. 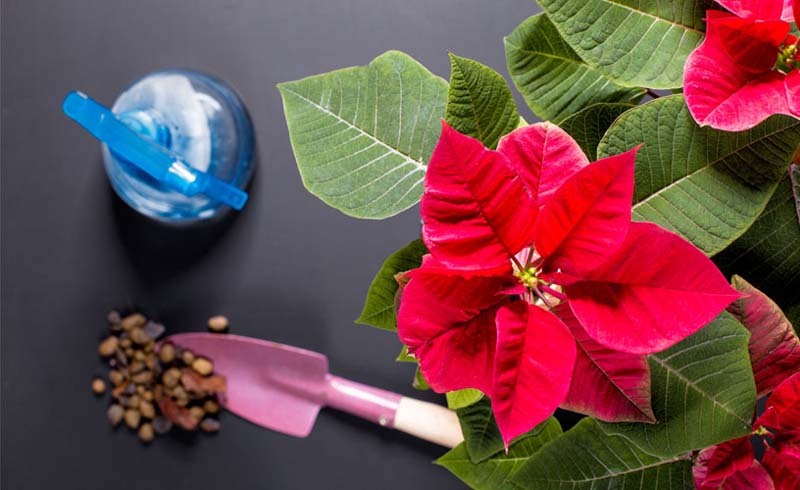 Keep poinsettias watered and fertilized until spring, then cut plants back to 5 inches. Wrap a nylon stocking around the base of the pot (to keep roots from migrating out) and set the pot outdoors in the ground in part shade. Pinch back new growth in summer to encourage branching. Bring indoors in September, repotting with one part each sand, peat, loam and perlite. They don’t naturally bloom at Christmas. At least not in this country. Growers fool the plants into holiday bloom by depriving them of light for 16 hours a day in the fall. If you decide to coax another year out of your plant, you can do the same thing at home. Simply put the poinsettia in a closet or cover with a black cloth every evening from 6 pm to 8 am, October through Thanksgiving.